4 x 7 Challenge - Success on Day 28! Thanks to Sarah over at Berry Barn Designs for hosting the 4 x 7 Challenge. The challenge was to spend 30 minutes a day sewing for the entire month of February. I am pleased to say I succeeded!!! I was a bit skeptical at first that I'd be able to pull it off, but I broke projects down into smaller pieces and kept track on a calendar. Worked on the prize for my blog anniversary. Quilted the HST wall hanging. FMQ didn't get the best of me this time!! Read about it here. Made the binding for the HST wall hanging. Sewed on the binding and finished the blog prize. Took photographs of HST wall hanging and blog prize and did computer work (blog post, searching internet, Bloglovin'). This was my February goal for ALYOF 2015. Cut fabric for charity HST for Maritime Modern Quilt Guild and worked on a layout for a baby quilt. MMQG Sew In. Oh how a month flies by. Sew In was awesome today!! I pieced a baby quilt and worked on my Mini Lotus wall hanging. There was a lot of socializing and admiring of everyone's projects. It's so great to get together with like-minded friends. 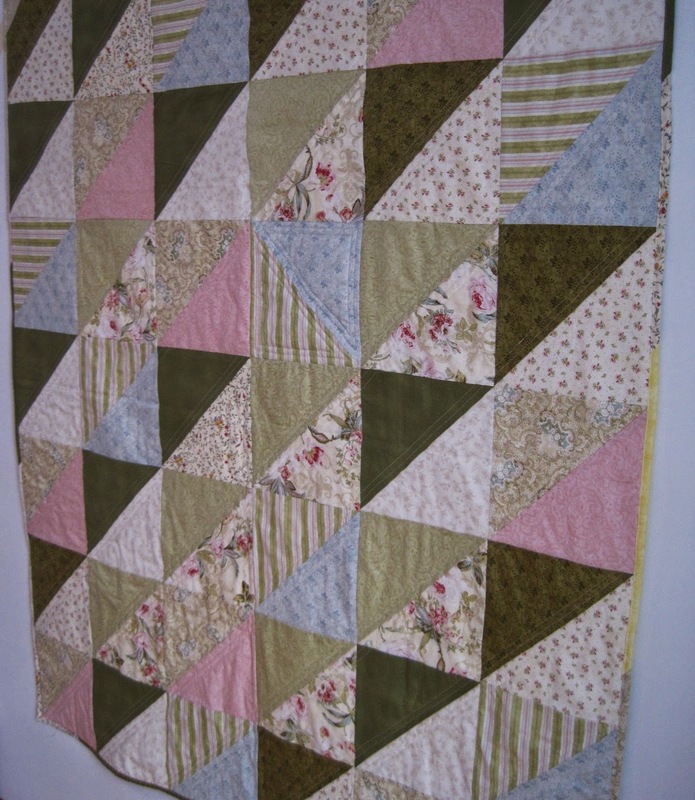 Any scrap less than 2.5 inches goes in the garbage or gifted to quilty friends. 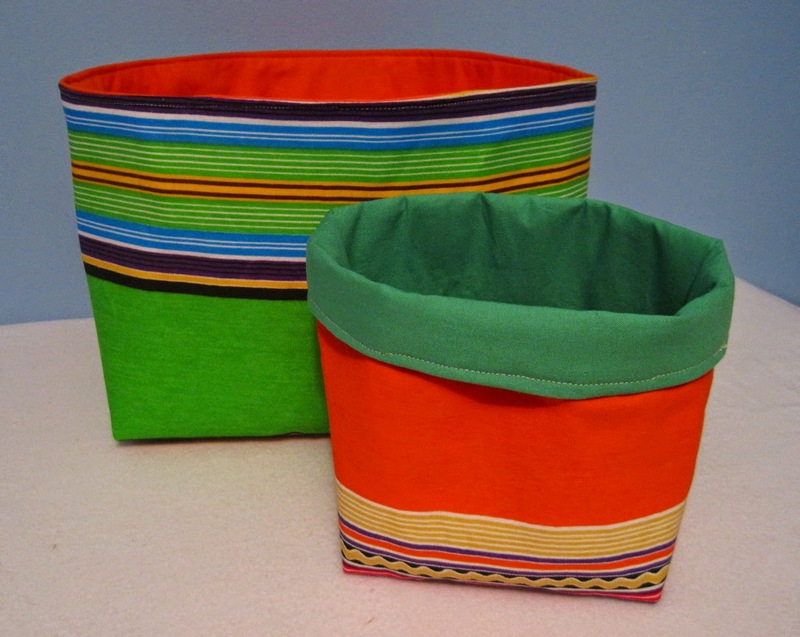 Scrapmaster made me these wonderful tissue holders from scraps I gave her at the January Sew In. Okay...maybe it's time to re-evaluate my view on scraps. She creates such wonderful projects from scraps. And so the week and February ends on a high note. Hoping that the momentum of sewing on a daily basis will stick. I hope your February was as great as mine. 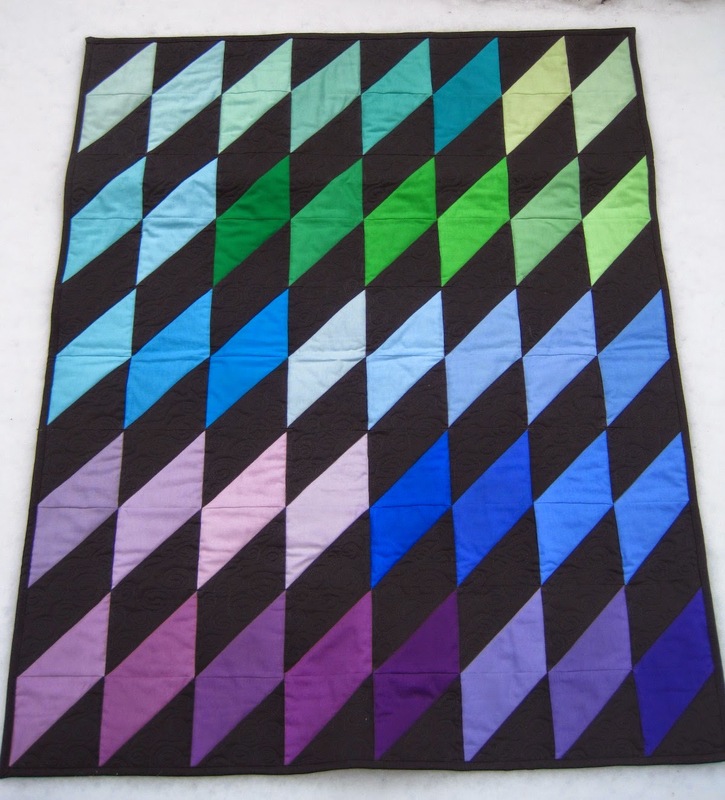 I mastered FMQ! Okay... maybe not mastered...more like it didn't get the better of me and make me cry. Don't think FMQ and I are close friends just yet, but definitely not enemies any more. Scrapmaster talked me down off the ledge and provided some encouragement. So I practiced FMQ spirals, took a break to sandwich the three layers, and then practiced again. I was ready. So not to be overwhelmed or frustrated, the plan was just to FMQ a small section. Section one went well, so I decided to do another section. It was like my machine actually loved FMQ for once -- no tension issues or breaking of thread. 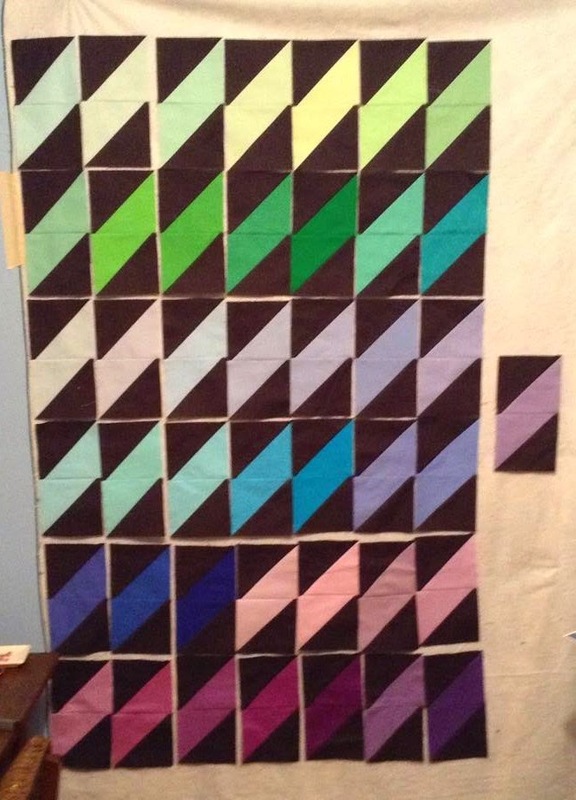 So decided to FMQ the entire project in one evening while things were going so well. 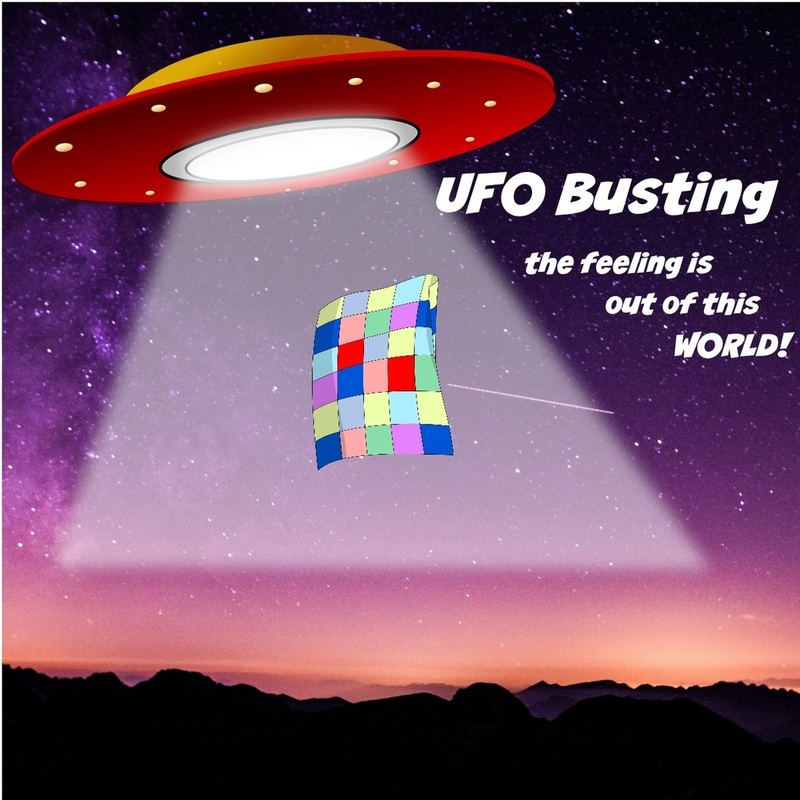 Check out my fabulous FMQ! I can't wait to get this on the wall in my sewing room. which is being hosted by Kim over at Persimon Dreams. Where does the time go? It's hard to believe the 4 x 7 Sewing Challenge is in its fourth and final week. 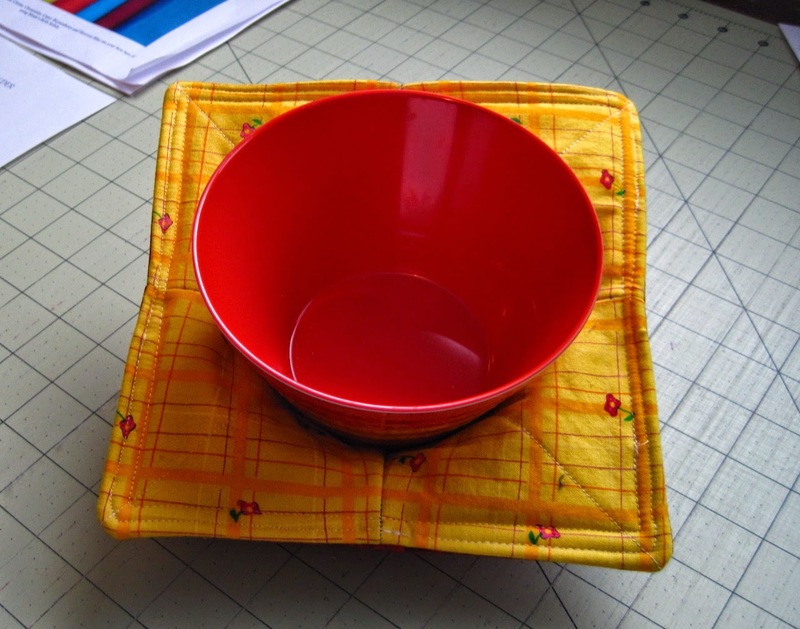 The challenge has been a great motivator to incorporate sewing into my daily routine. Sewed the binding on the HST charity quilt and started quilting another charity quilt. Finished quilting and binding the charity quilt and then sandwiched another charity quilt. Purchased some fabric for the charity HST blocks for Maritime Modern Quilt Guild and made two storage bins for my sister's birthday. 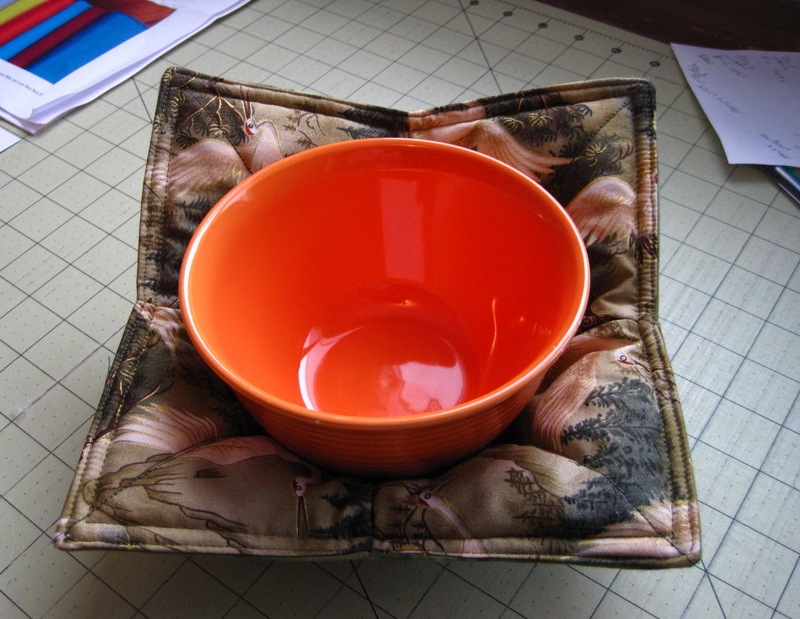 Made a mug rug for a swap at the March meeting of the MMQG. Cutting the fabric for the MMQG charity HST blocks. Buying fabric for a new project (read all about it here) and choosing fabric for a prize for my one-year blog anniversary. 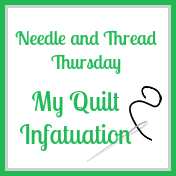 One year ago today, my blog started with a hastily put together post late at night so I could participate in The Library Project hosted by Adrienne over at Chezzetcook Modern Quilts. It's amazing what one will do for the chance to win a prize. 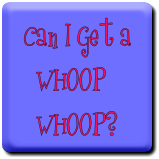 Huge thanks to my friend Jenn over at A Quarter Inch from the Edge for her encouragement to start this blog and for all her support and advice over the past year. Also thanks to Linda aka Scrapmaster and to M-R over at Quilt Matters for their tips and suggestions on how to improve the layout of my blog. It's great to have friends near and far willing to share their knowledge and expertise. So off to my LQS last night. One my bee mates works at my LQS, and she did an awesome job putting together this collection of delicious Kona. Thanks N!!! Since it would be awkward to ask all of you to buy me a present for my anniversary, I've decided to give away a present instead. Comment on this post (by Saturday, February 28) for a chance to win a little something from me. Anniversaries and birthdays are a time to reflect. What are you grateful for, or what makes you happy? 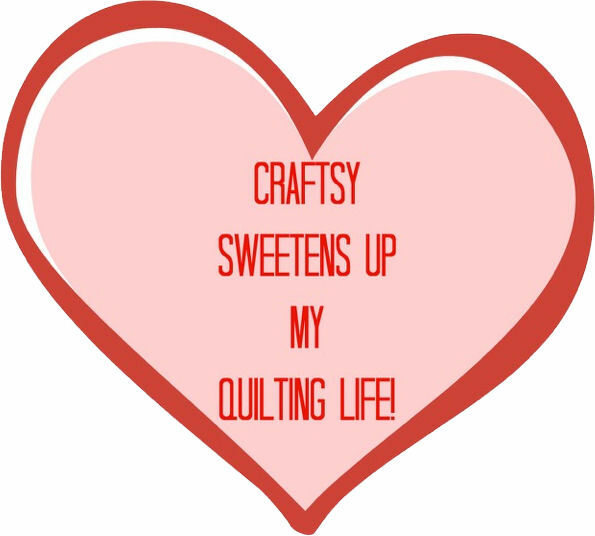 I'm grateful for all my quilting and blog friends. It's been a great year! Now on to year two. Week two of Berry Barn Designs 4 x 7 Sewing Challenge ended on a high note -- there was a lot accomplished this past week. Having accountability and breaking projects into smaller manageable pieces is the key to success. Made a microwave soup bowl holder and trimmed Kona HST's. Finished sewing HST's and played with various layouts. Wall hanging for my sewing room. No actual sewing as it was the Maritime Modern Quilt Guild's monthly meeting. 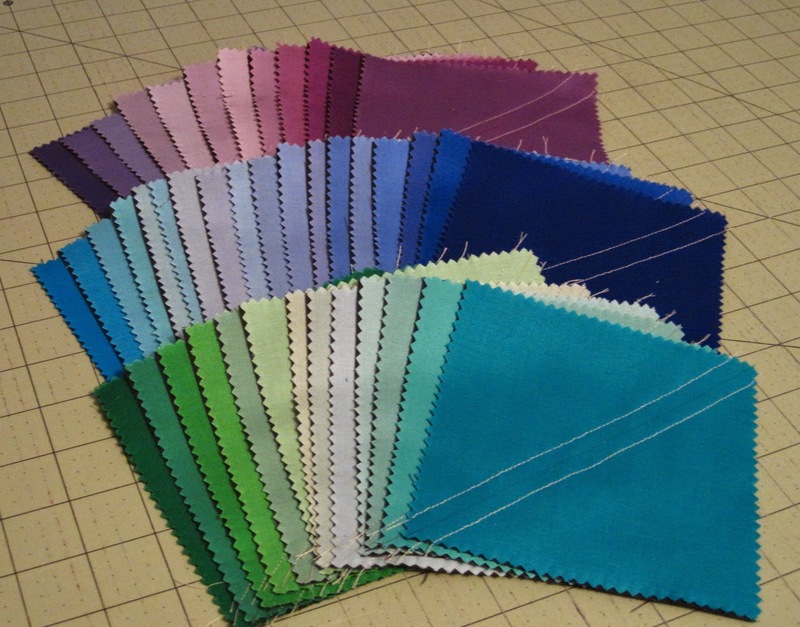 Received lots of quilting ideas for my HST project. Now re-thinking my straight-line diagonal plan. Consensus is free motion in the Charcoal sections to make the colours pop. Hmmm...think I have been convinced to do FMQ -- just need to decide on a motif. Made a baby quilt from beginning to end. Love vacation days!!! Kona Capri for the binding. Inside photo because wicked storm outside. I've been keeping track of my daily progress on a calendar to stay focused on this challenge. 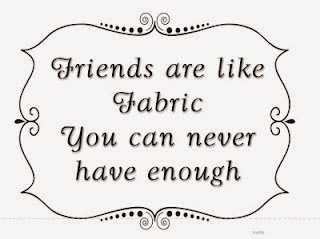 Think it will become a part of my sewing routine. 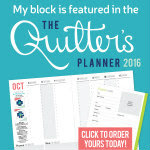 It's a great way to keep track of what you're doing, and it's a good planning tool. Thanks to Sarah for hosting this challenge! 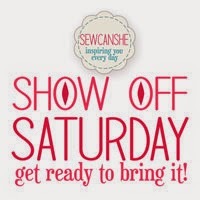 Off to do some more sewing as I'm tired of shovelling wet, heavy snow. Spring, where are you?? Jenn over at A Quarter Inch from the Edge threw down the challenge to create a Kona bundle. Who knew it would be so hard to choose just four. I was trying to stay away from my favourite orange, but I couldn't resist. Here are Sunny, Papaya, Orange, and Kumquat. These delicious colours are in my stash. 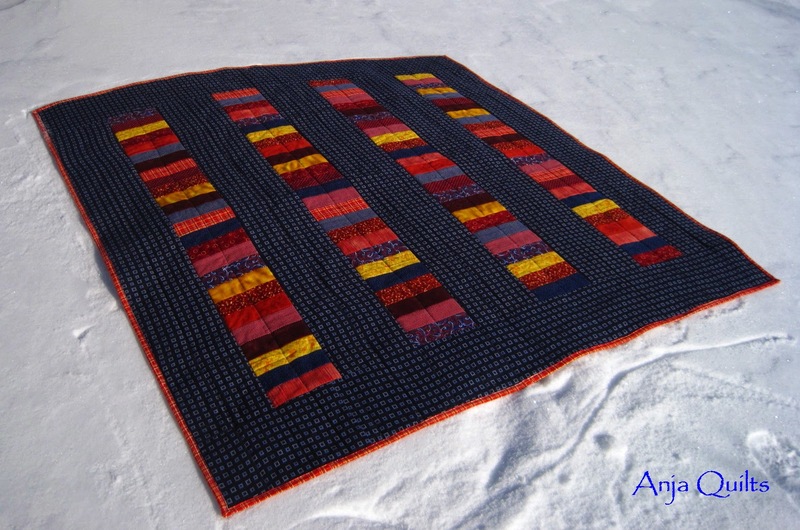 I have used Papaya and Orange previously, but these four are part of the wonderful 24 Kona colours in my Night Sky quilt by Jaybird Quilts. Stay tuned...I'm still in the process of cutting pieces. I also have Lemon, Bright Pink, and Lapis. I bought these because they intrigued me, but have no idea what to make yet. Any suggestions for a fourth colour? What are you favourite Kona colours? Linking up with Do you Heart Kona? 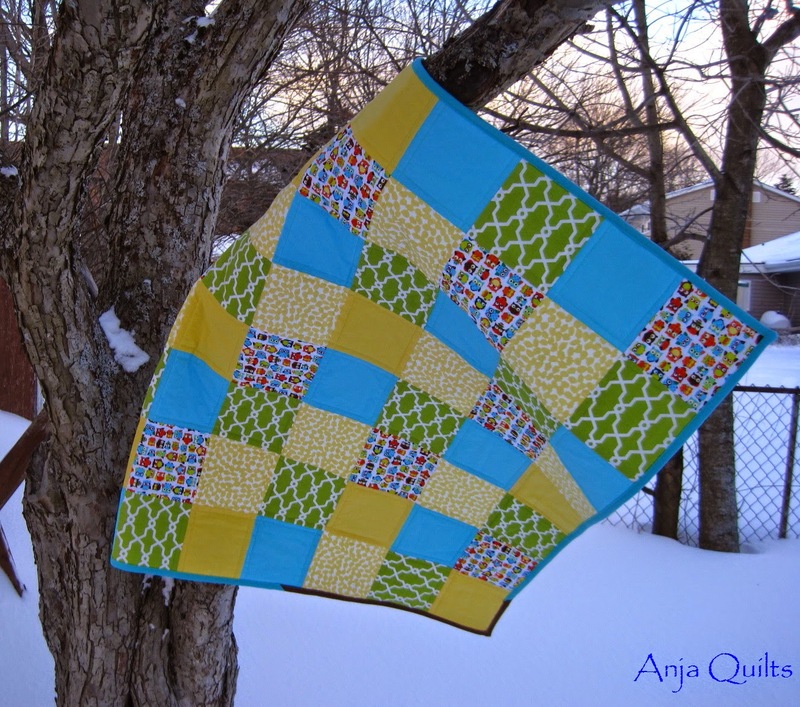 TGIFF - A Quilt in a Day! It's amazing what you can accomplish when you ignore housework and others tasks that need to be done. 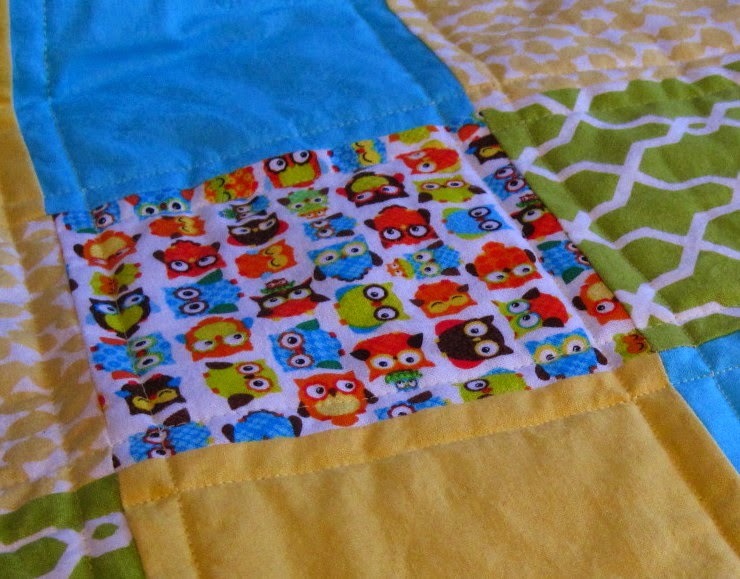 Today was an extremely productive vacation day -- a baby quilt completed from start to finish. 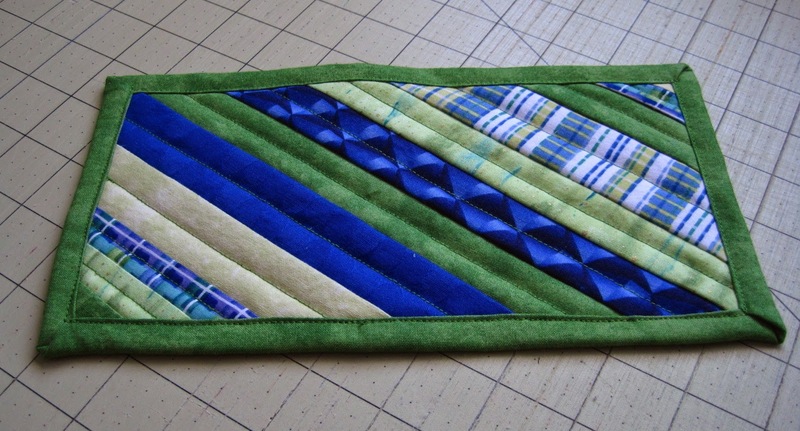 Instead of my usual diagonal quilting, I decided straight-line quilting on both sides of the seam. 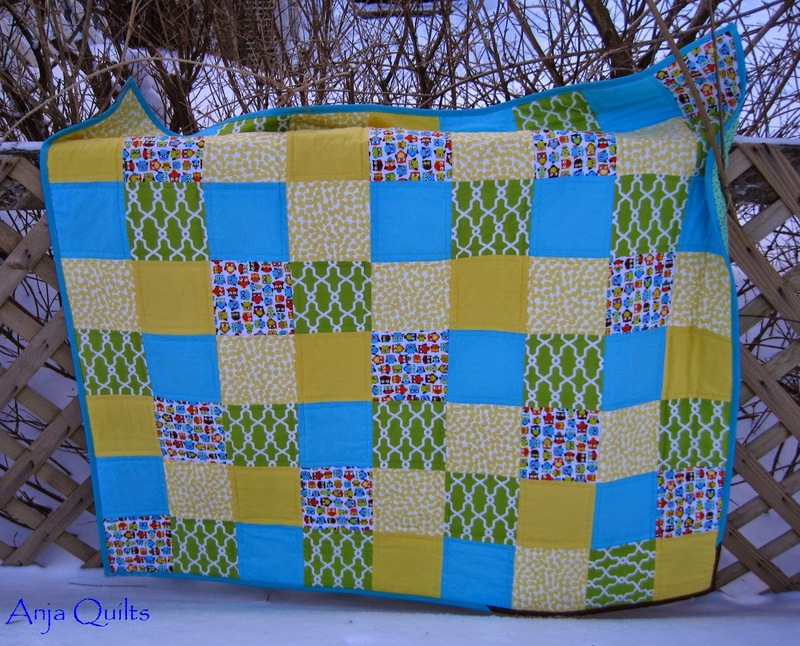 I've seen Adrienne over at Chezzetcook Modern Quilts do this and thought I'd give it a try. I like it...I like it a lot. Aren't these owls the cutest! Hoping to be as productive tomorrow, although I do need to do a bit of housework and laundry. On Sunday, I'm off to a workshop hosted by Scrapmaster to learn how to make fabric postcards. Can't wait! 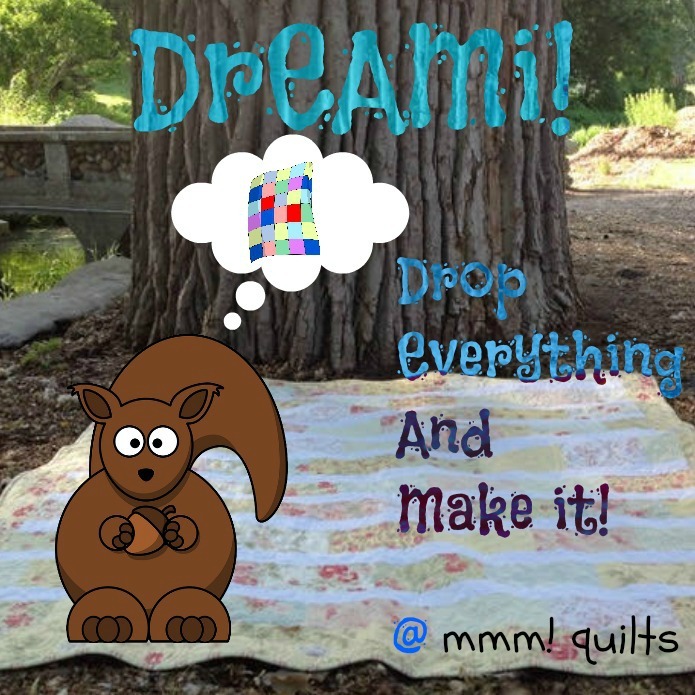 TGIFF is hosted by M-R over at Quilt Matters. Drop by to see what she's been up. 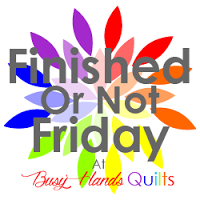 Also linking up with Finish it up Friday over at Crazy Mom Quilts. Thanks for all the suggestions on possible layouts for my HST project. In the end, for the first row and subsequent odd-numbered rows, light to dark going left to right. And then moving down to the even-numbered rows, light to dark going right to left. 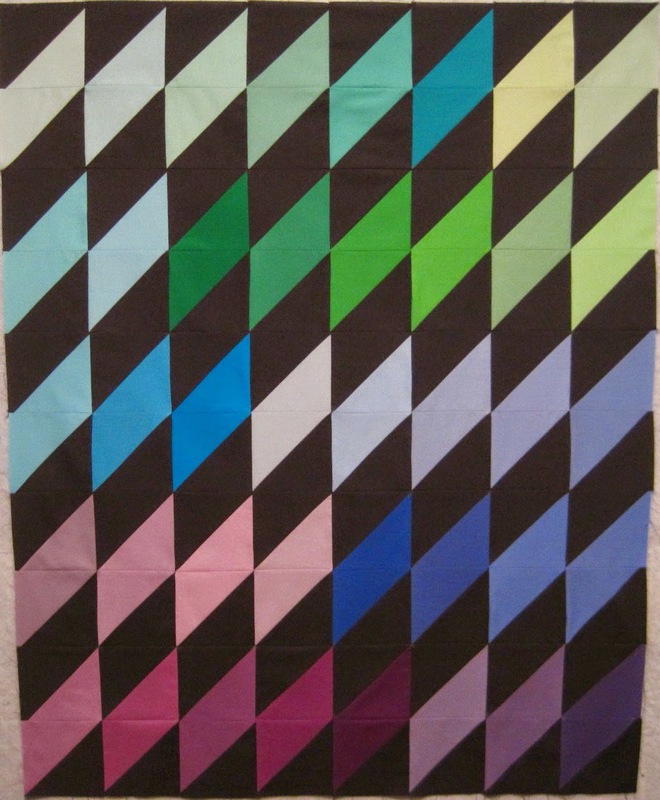 At 32 x 40 inches, this will become a wall hanging for my sewing room. It was difficult to arrange the colours, as some of the Kona's were very close in colour. There are two blue-green blocks in the top row that don't really belong with either green or blue, and some of the light blue ones had a hint of violet in them. But I'm happy because I used the Kona Sunrise charm pack and now have an interesting wall hanging for my sewing room. 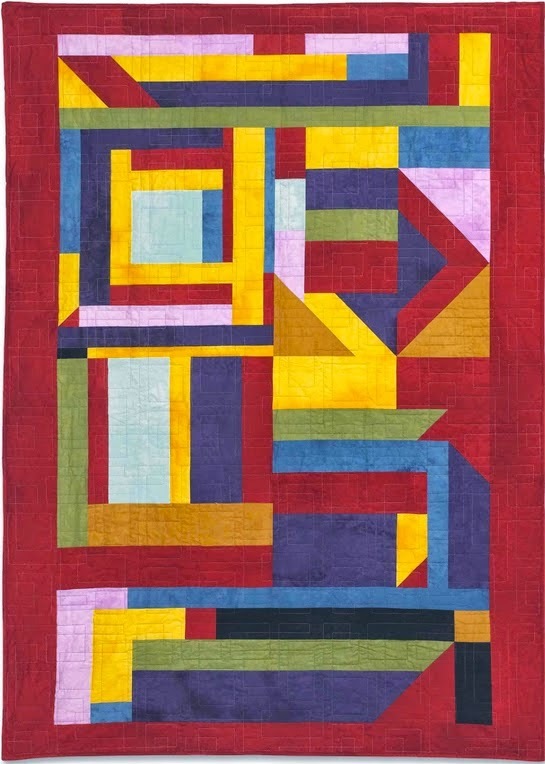 My first thought is to quilt diagonally -- bottom left to top right -- on both sides of the seam. But not sure what colour thread to use. 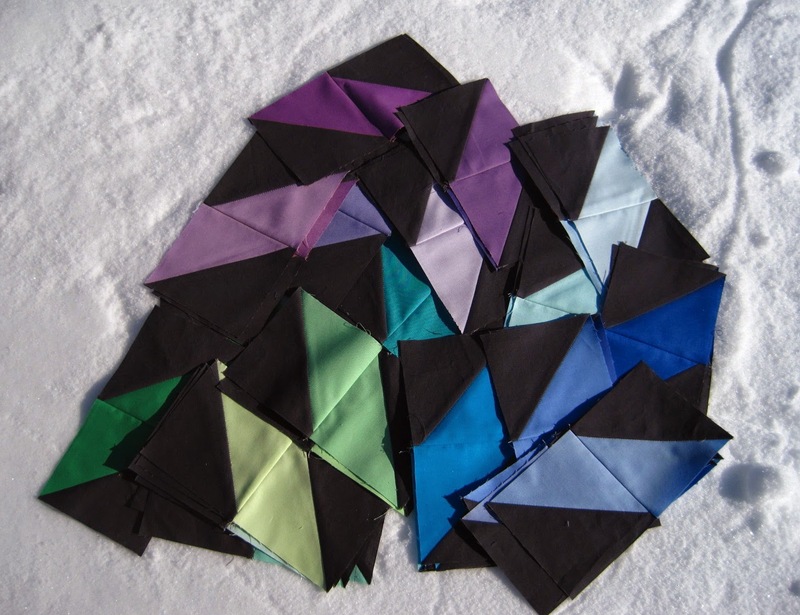 Would love to hear your suggestions on quilting and thread colour. 4 x 7 Week One Success! 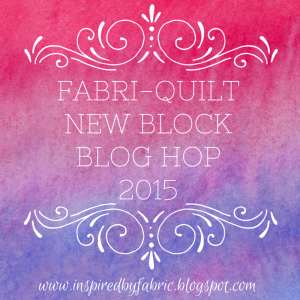 And so begins week two of the 4 x 7 challenge hosted by Sarah over at Berry Barn Designs. Week one was a great success -- at least 30 minutes of sewing each day!! The HST's were joined in pairs, so the end result was a diamond of each colour. Still debating on the layout. Light to dark in each colour family? Or random? Suggestions are greatly appreciated. Disappointed with photos on the iPad -- the colours look dull. One of my Bee Christmas gifts was a microwave bowl holder -- so you don't burn your hands on the hot bowl. Thanks to Sarah for hosting the 4 x 7 challenge. It's been great to have the accountability to make time for myself. Have you made time for yourself this week? 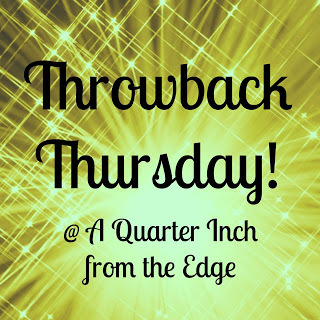 My friend Jenn over at A Quarter Inch from the Edge is hosting this week's Thank Goodness It's Finished Friday -- TGIFF. Hop on over to see what she (and others) have been creating. 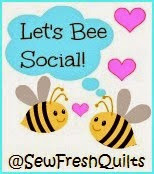 I committed myself to the 4 x 7 sewing challenge over at Berry Barn Designs, and so far this week, I have succeeded in sewing each day. Today's 30 minutes of sewing achieved the binding on this charity quilt that has been hanging around my sewing room far too long. Shovelling snow was too much work, so break time for some photos. An hour of shovelling by myself and then another hour with my nephew after the photo break. Thank goodness he didn't have school today. It was worth the $10 sacrifice from my fabric budget. The snow is gone, but there is still almost two inches of ice on the driveway and walkway. Spring...where are you???? I've decided to join A Lovely Year of Finishes 2015 to keep on track with projects. My February goal is to finish my Kona HST project. What have you finished this week? Be proud and shout it out loud! Laundry needed to be done, so toss in a load, set the timer for 30 minutes. and then start sewing. Tomorrow's goal will be to cut the squares in half and press open. The key to the challenge will be small achievable goals for each day. What's interrupting your ability to sew 30 minutes day? Good luck to us all. P.S. In case you're wondering (you know you were! ), the Kona colours are: Crocus, Mulberry, Magenta, Violet, Pansy, Petunia, Thistle, Orchid, Lilac, Lavender, Amethyst, Brt. Peri, Deep Blue, Surf, Lapis, Blue Jay, Candy Blue, Periwinkle, Grapemist, Cornflower, Blueberry, Lake, Cloud, Baby Blue, Robin Egg, Aqua, Azure, Bahama Blue, Peacock, Turquoise, Jade Green, Candy Green, Aloe, Pond, Ice Frappe, Mint, Honey Dew, Pear, Pistachio, Sour Apple, Kiwi, Fern, and Clover.